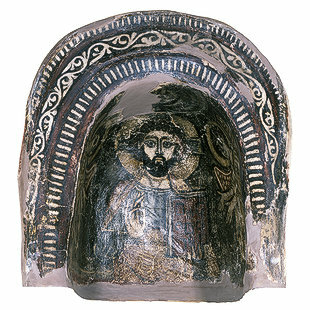 This niche has a portrait of the Lord Jesus Christ with the halo of glory around his head. He is holding the Holy Scripture in one hand, and with the other making the sign of blessing. The niche, in church terminology, is called "the Father's Bosom." It is located in the eastern wall inside the Sanctuary at the end of the church. The Lord Christ seated on His throne cloud is always portrayed on it. The halo around His head is distinguished by having a three-sided cross in it. The sign of blessing is made by the Lord Christ by putting the thumb on the middle joint of the middle finger. This sign of blessing is sometimes called the sign of victory.